Are you ready to live the Italian dream? You can make all your favorite dishes come to life with Just Like Parmesan from Violife, the world's first vegan parmesan that can be grated just like real cheese! With its strong nutty taste and tantalizing authentic aroma, Just Like Parmesan will be the main ingredient of your daily cuisine. Grate it over pasta, use it in soups and risottos, shave over your favorite salads, or enjoy on its own as a tasty snack, Just Like Parmesan will transform your meals into an authentic Italian meal. 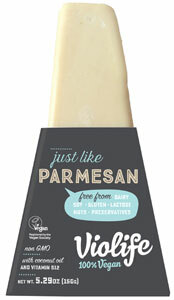 The perfect option for vegans and vegetarians everywhere, Just Like Parmesan is GMO-free, dairy-free, lactose-free, soy-free, gluten-free and preservative-free. 5.29 oz. (150g) Just Like Parmesan wedges are $5.99 each. From Anonymous of Namur, Belgium on 4/11/2019 . Incredibly delicious ! I use it like the real thing and it tastes great ! From Susan of Alexandria, Virginia on 1/10/2019 . It's not easy to find a vegan hard cheese. I liked it. From nelsona1216 of Bronx, New York on 1/6/2019 . From Marianne of Schaumburg, Illinois on 12/13/2018 . I've tried a lot of vegan cheeses and this one is the BEST I've had to date! Must try this product! From Carrie of Raleigh, North Carolina on 10/17/2018 . This cheese was awful and did not smell good, in addition to the bad taste.